Cruz left Tuesday's game after experiencing quad tightness as ran to first base on a RBI single. SCOTTSDALE, Ariz. — After missing the last 3 1/2 days with nasty case of the flu, Nelson Cruz’s return to the lineup lasted all of one at-bat. And his early exit wasn’t because of the lingering effects of the illness, but something that could end up being worse — tightness and discomfort in his right quadriceps. Cruz stepped to the plate in the top of the first inning of Tuesday’s Cactus League game vs. the Rockies at Salt River Fields. With two outs and Dee Gordon on third, he sliced a hard linedrive into the right field corner for what looked like a sure RBI double. Instead, he eased his way to first base for a single. At first, it seemed like Cruz might be taking it easy, considering he’d been ill the past few days. But that’s also not how Cruz plays. He hates to go easy on the bases. Replays showed Cruz sprinting hard out of the batter’s box, grimacing and then slowing up while grabbing at his upper thigh. He reached first base, asked for timeout from the umpire and started walking to the dugout. Athletic trainer Matt Toth met Cruz on the infield grass and walked him off the field. Cruz later headed to the visitor’s clubhouse to presumably head back to the Mariners facility in Peoria. It was yet another injury in spring training that’s been filled with them. 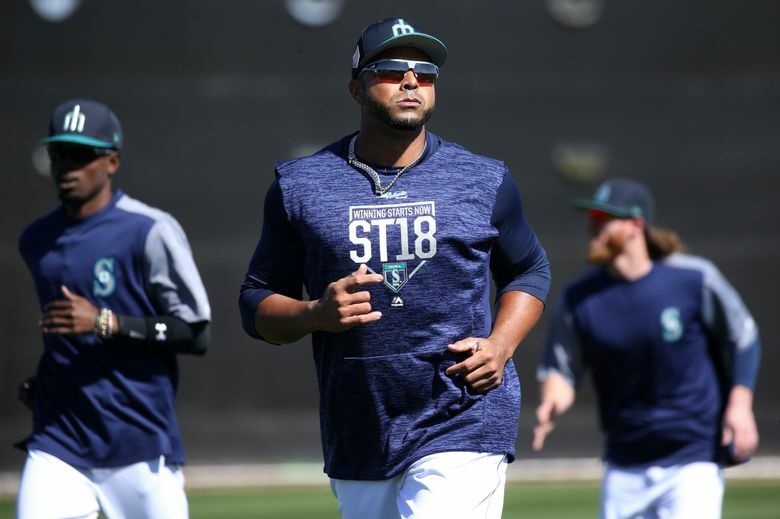 Two days earlier, Robinson Cano left a game with hamstring tightness, while a day earlier, Marco Gonzales left the game after being struck by a line drive. It only got worse for the Mariners. In the ninth inning, Andrew Romine, the projected back-up infielder/outfielder for the opening day roster, left the game after apparently injuring his left arm. Playing third base, Romine fielded a groundball and tried to tag the runner advancing to third. He made a lunge and then fell awkwardly to the turf, grabbing at his arm in pain. Obviously, there are growing complaints about Dr. Lorena Martin — the team’s new director of high performance, the team’s training staff and strength coaches and also the team’s offseason conditioning program. To be fair, Gonzales and Hernandez are injuries of chance not usage. Healy had the hand issue prior to joining the Mariners, but the initial handling of it could definitely be questioned. Because of their age Cano (35) and Cruz (37) are susceptible to these sorts of issues. Cano’s injury apparently stemmed from scar tissue in the hamstring dating back to last year’s injury. But if you couple these injuries with all the injuries last season, it’s a bad look for the Mariners.